A very uneventful day was cheered up a little late evening with a common rosefinch at Bridesness, but aside from the this the only notable migrants were a flock of 18 woodpigeon and 6 collared doves and a party of 11 house martins at Holland. A handful of spotted flycatchers were new in this morning, with 5 in total and a chiffchaff was at Holland. 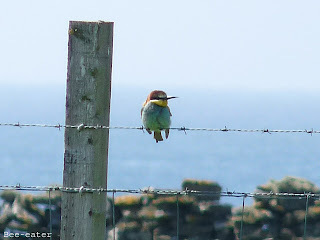 The first marsh warbler of the spring was at Mid House, a siskin at the Surgery and 3 collared dove and a woodpigeon remain, but bird of the day came in the afternoon when a bee-eater was spotted outside the Observatory. 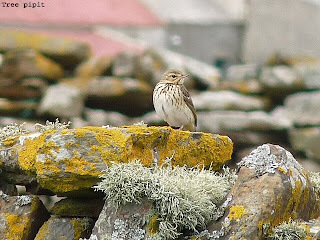 This is only the 2nd record for the island, the 1st being on 18th June 1988. 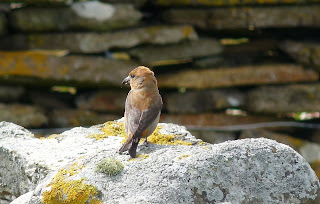 The male crossbill was still present, and brightened up a very quiet day. The only other migrants today were a carrion crow, 3 collared doves and 4 house martin. At holland were 4 collared doves, 2 woodpigeon, a chiffchaff and a garden warbler. A nice male crossbill was by Purtabreck, a grey heron was off Tor Ness and 3 pintail were on Gretchen Loch. 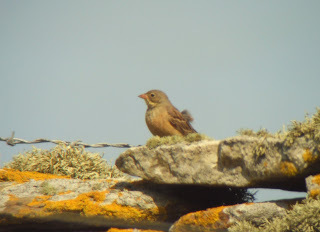 A male ortolan bunting at Stennabreck made up for a distinct lack of migrants today, with a chiffchaff at Holland the only warbler seen. The glaucous gull was still present, the sparrowhawk was in Holland and a hen harrier flew south. The long staying snow bunting remained at Bridesness, a mealy redpoll was at Sandbach and other sightings included 2 whimbrel, 2 woodpigeon, 4 collared dove and a white wagtail. At Holland were 7 collared doves, 2 woodpigeon, a sparrowhawk, a robin and 3 chiffchaff. 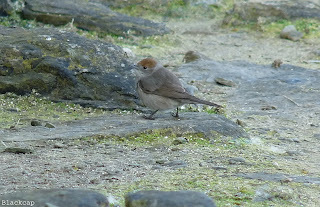 A garden warbler was at the Surgery, as was the springs first common rosefinch and 11 house martin were seen. A total of 180 turnstone went out northwest in the afternoon, and other waders included 140 knot at Nether Linnay, 43 dunlin and a whimbrel. 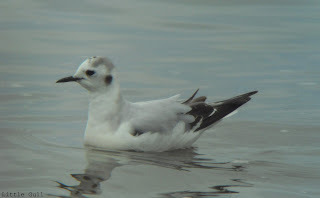 A little gull was at Westness and the glaucous gull still in Nouster. A female sparrowhawk, 4 collared doves and a song thrush were in Holland, a garden warbler and a chiffchaff at the Surgery and a sand martin was at Bridesness. The glaucous gull was still at the south end, 3 jackdaw were seen and a black redstart was by the Lighthouse. 2 whooper swans on Garso Loch was an odd arrival, 3 grey heron were on Ancum Loch and at least 2 mealy redpoll were seen. Interesting waders were represented by a common sandpiper at Twinyes, 2 curlew sandpiper on Trolla Vatn and 90 knot at Nether Linnay. The first summer glaucous gull was still in Nouster bay, 3 sand martin and 3 house martin were at Bridesness and a siskin was singing outside the Observatory. Still at Holland were the 4 collared doves and a spotted flycatcher, and warblers today consisted 4 chiffchaff, 3 blackcap, 2 garden warbler and a lesser whitethroat. 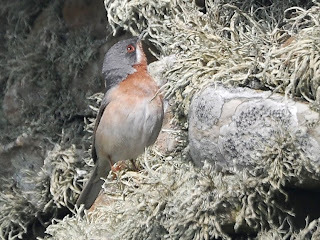 Below: Photgraphs taken by Lang Stewart on 18th May of the male subalpine warbler and icterine warbler. 2 chiffchaff and a garden warbler were seen at Holland in the morning, with 3 collared dove and a woodpigeon there at dusk. The glaucous gull was still in Nouster Bay where a curlew sandpiper was with sanderling. 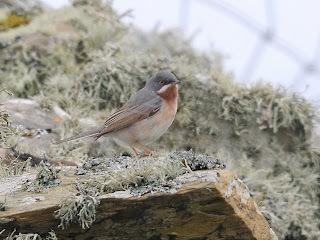 A flava was seen briefly at Bridesness and a confiding male bluethroat was singing outside the Obs bar. Around the Observatory were 3 willow warbler and 2 spotted flycatcher, 3 garden warbler, lesser whitethroat and 2 woodpigeon were at Holland and a goldfinch was seen. A smart male brambling was by the road at Purtabreck and at the north end a grey-headed wagtail was by Bewan Loch. 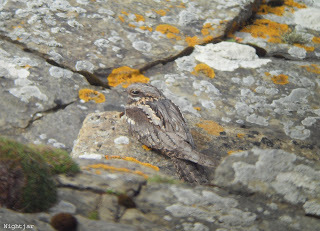 A male nightjar was a surprise along the cliffs at Gue Park, a ring ouzel was nearby and the glaucous gull was still at the south end. Other migrants included 3 grey heron, a collared dove, 178 swallow, 20 house martin, a robin, a whitethroat, a siskin and a jackdaw, and to round the day off an osprey flew through in the evening. As to be expected with the light winds and clear skies overnight, a mass clear out of migrants left little in comparison to recent days. A glaucous gull appeared on the dead dolphin in Nouster Bay, a new wood warbler was seen at Ancum plus 2 still at Gretchen and a respectable count of 247 ringed plover. 3 jackdaw were seen and other leftovers included a curlew & common sandpiper, 3 sand martin, 13 house martin, 6 tree pipit, 2 robin, 2 redstart, 2 lesser whitethroat, 10 whitethroat, 10 garden warbler, 1 blackcap, 6 chiffchaff, 2 willow warbler, 2 spotted flycatcher, a chaffinch and a sparrowhawk. Calmer weather gave a chance to mist net in Holland gardens, resulting in a fair number of migrants trapped, and proved just how much must be missed in there on windy days. 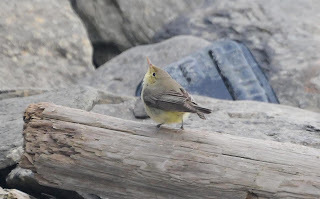 The best of which was an icterine warbler, with a 2nd bird seen at Greenwall. The days list of other warblers included 2 wood, 21 garden, 22 willow, 1 reed, 5 chiffchaff, 7 lesser whitethroat, 16 whitethroat and a blackcap. 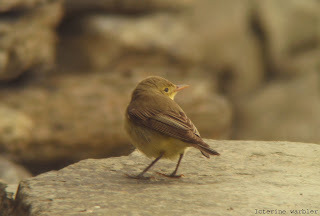 2 robin are an unusual May record, 3 bluethroat were seen and a cuckoo was seen at Holland. Interesting wagtails consisted 3 grey-headed at Ancum and a male blue -headed at Brides, 4 sparrowhawk were seen and an early afternoon highlight was of a honey buzzard flying north. The rest of the days sightings were; 153 knot, 7 common sandpiper, a short-eared owl, a swift, 21 house martin, 15 tree pipit, 2 whinchat, 14 redstart, 10 spotted and 6 pied flycatcher and a count of 57 lesser black-backed gulls is worth a mention. 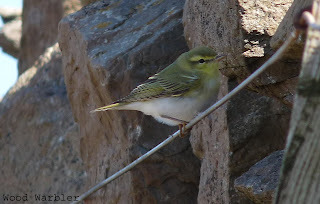 Common migrants were still plentiful today, with a number of new arrivals, most notably the first cuckoo, reed warbler and crossbill of the year. The male subalpine warbler at Rue remains the highlight for the moment, a new icterine warbler was at Gretchen and 2 marsh harriers flew through in the afternoon. And sticking with raptors a minimum of 4 sparrowhawks and a kestrel were seen. Other totals for the day were of 5 common sandpiper, 1 curlew sandpiper, 15 house martin, 15 tree pipit, a grey-headed wagtail on Ancum, a black redstart, 9 redstart, 2 bluethroat, 4 whinchat, 1 stonechat, 2 female ring ouzels, a grasshopper warbler, 6 lesser whitethroats, 14 whitethroat, 10 garden warbler, 2 blackcap, 4 wood warbler including a new bird at Loch End, 6 chiffchaff, 24 willow warbler, 9 spotted and 4 pied flycatcher. 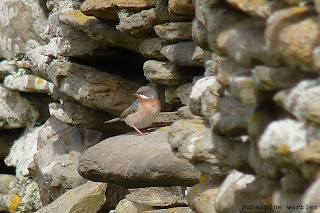 The male subalpine warbler was still at Rue, a total of 6 bluethroats included 4 new birds and 5 dotterel were seen at various sites on the island. An icterine warbler was at Holland and other warblers consisted 3 wood, 35 willow, 6 chiffchaff, 3 blackcap, 10 lesser whitethroat and 15 whitethroat. After a single yesterday, a good count of 4 grey-headed wagtails were seen plus 2 flava sp. A ring ouzel was in the north and some noteworthy spring counts today included 10 common sandpiper, 11 whinchat, 13 tree pipit and 13 house martin. Also seen were 17 whimbrel, 2 curlew sandpiper, 119 swallow, 3 sand martin, a dunnock, 16 redstart, 1 stonechat, a fieldfare, 3 song thrush, 18 spotted and 7 pied flycatcher. 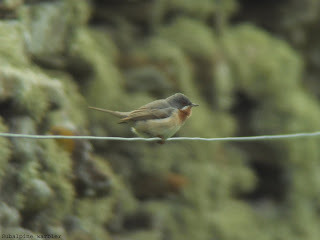 An icterine warbler was singing in Holland early morning and 3 bluethroats were seen. 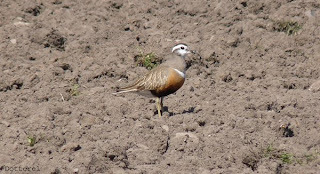 6 dotterel were in the ploughed field at Cott with 26 knot, 2 common sandpiper at West Beach and a male subalpine warbler was found at Rue just before lunchtime, presumably of the eastern race albistriata. 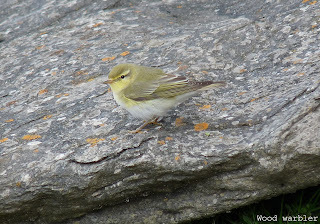 5 wood warbler were logged, a male grey-headed wagtail was at West Beach and other bits included 6 tree pipit, 8 redstart, 3 whinchat, 10 spotted flycatcher, 8 pied flycatcher, 5 lesser whitethroat, 6 whitethroat, 10 garden warbler, 6 chiffchaff, 17 willow warbler and a blackcap. 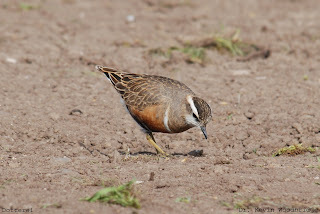 4 dotterel at Cott in the morning became 6 by the evening and a fine male bluethroat was by the Lighthouse. The 2 curlew sandpiper were on Troll Vatn Loch and other notable waders included 19 knot and a whimbrel. Also at the north end were a swift, lesser whitethroat and a white wagtail. 3 sand martin and a house martin were over Gretchen Loch, a male kestrel and a sparrowhawk by Holland and in the gardens were a siskin, woodpigeon, 2 blackcap and a chiffchaff. A stonechat was seen at Greenwall and a spotted flycatcher at the Obs, whilst singles of song thrush and willow warbler were noted elsewhere. Easterly winds arrived at last, and although no huge numbers the island had a sprinkling of migrants with a bunch of firsts for the year. 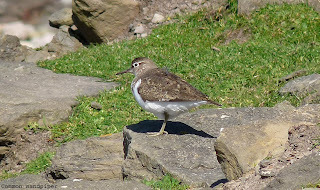 A common sandpiper was near Sennes, redstart, pied and spotted flycatcher all around Twingness and a corncrake ran across the road into Holland. 2 blackcaps, a willow warbler and a sparrowhawk were spotted at Holland, and 4 sedge warbler and 6 chiffchaff were seen. 4 dotterel came in at Kirbest before flying off east, black redstarts were at the Observatory and Hooking, a late fieldfare and a whinchat were by Cursitter and other migrants included a snow bunting, 2 house martin, 2 sand martin, 3 common redpoll and singles of woodpigeon and collared dove. The first sedge warbler was singing at Ancum Loch, 5 house martin and a sand martin were seen and an osprey flew though heading north. A willow warbler was along the west dyke, 2 chiffchaff at the north end and another at Holland, with 3 collared dove there also. 2 jackdaw and a carrion crow were in the south and 2 curlew sandpiper were on Trolla Vatn Loch, but bird of the day came late in the evening with an adult summer mediterranean gull in a ploughed field at Cott with 17 lesser black-backed gulls and 88 herring gulls. Very limited coverage over past few days as most efforts were put towards helping canon netting for a colour ringing scheme on sanderling and purple sandpipers, and completing the cropping at the Observatory with a single field of kale and 2 sacrificial bird crops sown this year. 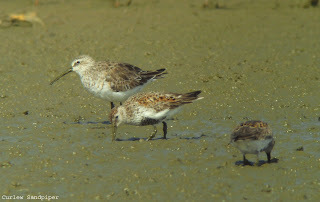 62 knot were seen on 10th and 44 dunlin were on the Links. The odd chiffchaff was noted at Holland and a single blackcap, and a marsh harrier flew north on 11th. 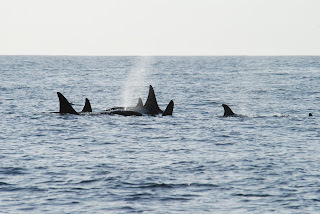 To compensate for a lack of bird sightings 4 killer whales were seen well off the north on 9th, and on 11th an amazing pod of 15+ slowly cruised past the Observatory just offshore and along the west coast. 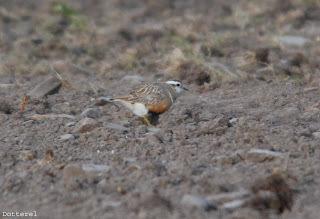 5 dotterel were the highlight of a very windy day, feeding in a ploughed field at Ancum in the evening. A blackcap was still at Gretchen and a chiffchaff in Holland, but a greenfinch was new at Kirbest, and counts of 500 shag on Green Skerry, 284 purple sandpiper and 642 arctic terns are all highest counts so far this month. The curlew sandpiper had moved to Gretchen Loch, a snow bunting was at Brides'ness and migrant corvids included at least 4 carrion crows and 3 raven. It continues to be rather desperate in terms of migrants with the only notable sightings being a chiffchaff, a knot, a whimbrel and 3 carrion crow. 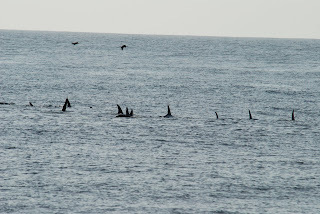 The pink-footed goose flock is still present, 135 arctic terns were seen and 2 merlins were at the south of the island. The goldfinch and flock of c100 pink-footed geese are still present, 2 collared dove were in Holland as were a blackcap and a chiffchaff and elsewhere 2 twite, 5 whimbrel and 19 wheatear were seen. 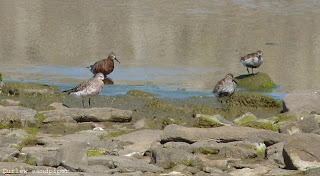 The 97 pink-footed geese remain at Peckhole and the curlew sandpiper is still on Trolla Vatn. A tree pipit flew over Holland and a green sandpiper was new at Bridesness, but the westerly winds appear to have put a hold on things with no warblers seen today! 5 collared doves and a woodpigeon were at Holland, a carrion crow and 9 whimbrel were seen and on the Links were 54 ringed plover, 104 sanderling and 35 dunlin. 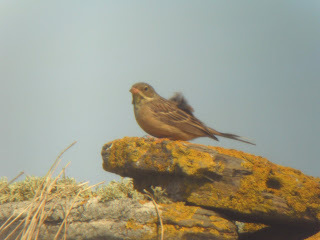 A tree pipit and 317 arctic terns were at Brides'ness where a sparrowhawk flew over and the goldfinch was at Greenwall. A mealy redpoll was seen, the lesser whitethroat was still at the Observatory and a blackcap, a willow warbler and 5 chiffchaff were at Holland. Other migrants included a whimbrel, 2 collared dove and 3 woodpigeon. 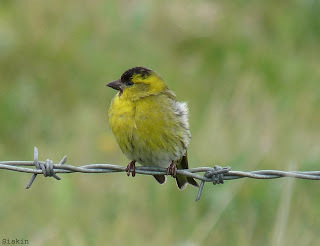 Still no numbers of migrants but a few interesting sightings today included most notably a goldfinch at the Surgery. At the north end a 1st summer iceland gull was amongst a small gull roost and a curlew sandpiper was on Trolla Vatn Loch. The first tree pipit of the spring was at the Observatory, a sand martin was by the Kirk and other sightings included a lesser whitethroat, 4 blackcap, 5 chiffchaff, a willow warbler, singles of woodpigeon and collared dove, a white wagtail, a rook and 4 carrion crows. A relatively quiet day though a few bits appeared after the afternoon rain. 3 carrion crow, 3 rook and a hybrid carrion x hooded crow were about in the morning, blackcaps were at Holland and Gretchen and a whimbrel at West Beach. A flock of 100 pink-footed geese came in and settled at Peckhole, a very unusual May record. 2 siskin, a lesser whitethroat and a willow warbler were by the Observatory and a sparrowhawk was at Holland. 3 grey heron were at Tor Ness and 7 arctic terns were seen. A pink-footed goose was with greylag's at Hooking today, a fieldfare was at Greenwall and a siskin by the shop. 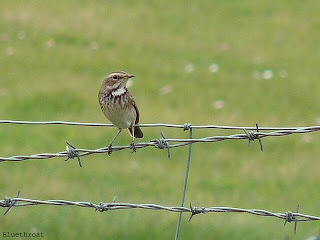 An arctic tern and a whimbrel were at Brides', 2 twite were at Kirbest and 4 chiffchaff and a willow warbler were seen.